If you want to take the work out of your tough jobs, try R&R. The unique cleaning properties allow it to be applied to vertical surfaces without excessive running. This gives the product time to work on those hard to get spots and vertical surfaces. 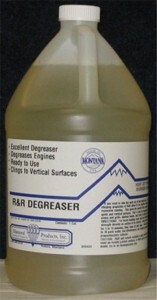 R&R is ideal for degreasing engines, cleaning ovens and grills, kitchen hoods, and areas of smoke and diesel buildup.